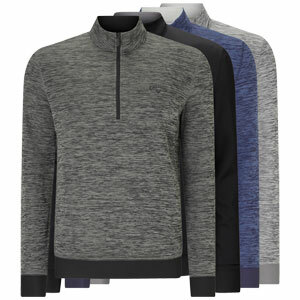 Water resistant 1/4 zip heathered fleece pullover. Fleece lined, this is the ultimate duel purpose vest with added water repellency to the outer fabric, to keep light precipitation from soaking through to the fleece lining. Ribbed finish to ensure the garment retains it's shape and provides a good fit. Callaway heat seal tour logo on the wearer's left chest.